Any rail is good rail? I am unfamiliar with this rail line. Where else does Rail link serve? Melbourne Rail Link that includes a connection to the airport and an underground city train running from Southern Cross to Fisherman’s Bend and then to South Yarra via a new station at Domain, near the Shrine. Grids are what we need. I’d build a rail line that ran from Doncaster through Clifton Hill Station and out to Highpoint shopping centre. I’d build one from Altona via St Kilda to Chadstone Shopping centre, I’d extend the train from Williamstown via Yarraville up to Essendon Fields, and then build a Hoddle Street competitor that went from Sandringham all the way north to Bundoora. That way you’d have a nice square about 2-5 km out from the city. It would be a start. I like that article but it presents an over-simplified view of travel and density that leads to bad conclusions. If a city doesn’t have uniform density (and few cities do) it doesn’t need (and can’t run) uniform transport lines, but is better off with a nodal network. If users are travelling vastly different distances (and they are) then they are better off with tiered transport options with different stopping patterns to reduce walk times, and provide connections between local and regionally orientated transport. Grids are fantastic in limited applications, mind. Similarly, unless you expect to see a vast increase in density (and jobs) along the corridors you propose, it is hard to see why they’d need a heavy rail line – a better bus service and light-rail perhaps. Not that Melbourne is well designed. We should be aiming to radically speed up the rail system so it doesn’t compete with local options, and then use those local options to fill in the gaps. On Fishermen’s Bend. Presuming the rail station is placed in an area orientated towards employment (within the vicinity of the CBD/Docklands), and the area along Williamstown Road is orientated towards housing, then the station is primarily serving suburban commuters, which is a reasonable transport aim, if probably unjustified on economic grounds. For people living in Fishermen’s Bend, they’d only need rail if they were travelling to the suburbs (and let’s be honest, taking rail to work in the suburbs is neither common nor easy). A 3km trip to the CBD/Docklands is better served by light-rail (400m stop spacing, 30km/h = 2min walk+6min trip + 2min walk) vs heavy rail (800m stop spacing, 60km/h = 4+3+4). Local transport doesn’t make for good headlines though. we now have the ability to combine data points previously not considered to design an optimal system not based on geometry, but future demand. if victoria had implemented a true analytics-based ticketing system, we could combine that data with traffic data, social media data, anonmyous data about how people traverse melbourne in a normal day, combine with real-estate and demographic planning data. add in toll system data, transactional data from the banking system (remember this is all anonymous, so no privacy concerns) – even telco data woudl help. then, using predictive analytics to help forecast future demand we could work out how to best plan a transit system, rather than ‘rules of thumb’. Port Melbourne is currently the poor cousin to the CBD, but it will not always be that way. In the last ten years there has been a significant increase in new businesses around the once skeletal precinct. A lot of tech industries have been attracted to sites which were easy to clear and build state of the art facilities purpose built to their needs. Cafes and eateries are on the rise to feed the businesses in the area and recent planning announcements suggest more development is on the way with more employees commuting on PT. The area is poorly serviced by the current rail network, especially from the perspective of western suburbs resident working in the Port Melbourne area. A rail link into the docklands and Port Melbourne area would be welcome but location will be important. 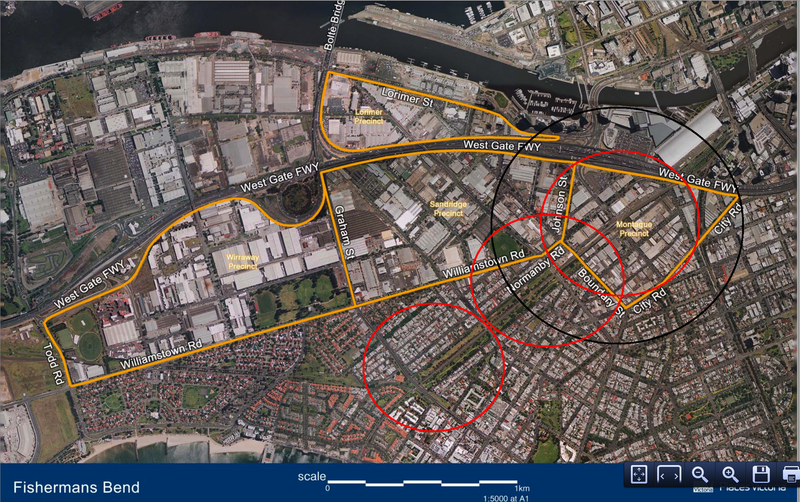 As you identify if it is too close to the CBD end of Port Melbourne it will not be as effective as if it was, say in the area around Graham street. Ideally there would be multiple stations along the whole precinct; however this may not be possible given the larger perspective of the project. See this vid (https://www.youtube.com/watch?v=CQ2IGZYTTNw) for an explanation of why they are going with the proposed layout, it’s primarily about separation of routes to create distinct lines that don’t converge and bottleneck as much as the current system. Whilst I see the value of a centralised business district I also see that the current CBD needs a breather and growth will most likely be easier to service around the periphery, rather than in the overworked core. But hey, that’s just my opinion man.